Pete Campione is a trainer/behaviorist with Kindred Souls in Howell, NJ. We "found" him in our search for resources for our more difficult (read "damaged" ) dogs. After several conversations with him he went to our website and read Quigley's story. On his own initiative he lead a fundraising drive for Quigley and raised over $1200 towards the $3K that we have spent so far on Quigley's 3 surgeries. We think Q may be out of the woods now, but still waiting a couple of weeks before putting him up for adoption. We haven't had the opportunity of working with Pete yet, but please read an excerpt from a blog he has on his website that I have copied below. You can also read Quigley's blog at this URL too. In my practice, I would safely say that out of my entire clientele, I deal with an average 40% of dogs that have been adopted, from either a rescue or a shelter. Through my teaching, I have seen certain trends, both in what goes into making adoptions more successful and even in the dogs themselves. Some trends have been good ( how nice to see the White German Shepherd Breeders breeding for better temperament) and some have shown problematic ( what is up with the marked increase of aggression in male Boxers and Weimeraners??? And its not just pet store dogs…an alarming number of these aggressive dogs are coming from supposedly reputable breeders. Folks we should never breed for a harder dog for the public to handle.– Please realize that speaking/writing about trends in dogs and behavior must include a cross section of dogs from various regions as dogs are always a reflection of the existing pack and the environment itself. When I report to you that I have dealt with more anxiety related issues in dogs from the northeast than in the West and in the south, it is merely what I see. The same with other trends. You must notice this because it translates into the deep effect we have on our canine companions reactions when assimilating into our society. This becomes even more important when you are adopting a dog previously programmed to the former environment. Adopting transient dogs can be both easy and rewarding. Adopting a dog doesn’t mean you need to suspend all sense of logic. Adoption in itself is an admirable thing. But “forever” adoption is a thing of beauty. Its like meeting a soulmate. But meeting your soulmate takes time, reason and patience. Oddly enough , the majority of my dogs were picked on “feeling”, but they had already met all essential qualifications. You SHOULD pick a dog on gut emotion, but your choices should be limited to types of dogs that fit your lifestyle. Purely emotional choices are often very much like gambling. The question of whether it was the right choice must now evolve. Purely emotional choices involve more work, because if you choose emotionally you have to adjust YOUR life, but if your choose rationally the dog “fits” your life. However, the human error factor in picking the right dog is unfortunately growing, and there are many dogs who could be saved and are not. There is a common misconception that by adopting an adult dog, you save all the “puppy issues”. SURPRISE!!!!!!!!!!!! You have just as much work with an adult dog and need to allow as much time. Always remember when adopting, that when moving a dog from one environment to another, his former behaviors do not always transfer. Dogs reflect the environment they are in. So a new home, to a dog, means new rules with a new pack. You will need to teach this dog , just as you might teach a puppy, where the bathroom is, what behaviors(jumping on furniture etc) are acceptable, and most importantly that YOU are the new leader. Lets start by defining the job of an Adoptive Parent. Definitions are often made clearer by what they are NOT as much as what they are. The first thing we need to do is deal in generalities. Your adopted dog may have been “evaluated” before you meet. Please lets get something straight. No one can evaluate a dog in an hour. There are so-called “trainers” who have made a lot of money annoying dogs, ie Sue Sternberg and the Plastic Hand from HELL, (please someone give me an hour with this woman and that hand!!!). Then they profile them on their ability to stand abuse (Ever think of seeing if a dog can be taught toleration????). But this type of quickie evaluation is a scam. Evaluation is cumulative and your adopted dogs’ profile will be built over time. Because of time constraints involved with most shelters and rescues, it may be necessary to run certain tests on dogs to gain some insight into temperament. But it must always be remembered that evaluation of any dog changes with its surroundings and the people involved at the time of testing. A true understanding of a dogs behavior patterns are gathered through an assessment of the dogs’ ability to learn what we want and the number of times he chooses to comply (not his ability to tolerate and sustain human annoyance. This is why Structure, Instruction and Monitoring is so important during the first 30 days of your new dogs introduction to your home. You run the excellent chance of CREATING appropriate behavior. The profile you might receive with your adopted dog is useful only as an insight into “capable behavior”. For example, when someone tells you “this dog is housebroken”, that means merely that he was housebroken before and has shown that behavior. Whether he remains housebroken in the adoptive home is a function of the humans making sure the dog has the information to stay that way. Life with us, for a dog, is like one big open book test. We provide the information of what we want. We show the dog the advantages of compliance and the consequences of non-compliance. This clearly will give you a better read on a dogs profile of living within a social structure. In other words…SET THE DOG UP TO WIN and see if he is sound enough to make that choice. And how many times he does so. Remember that the more you know about a dog, the more you know about whether the dog is right for you. YOUR JOB: With any new dog that enters your home it is your primary job to be PRO-ACTIVE in structuring this dogs existence so you can better INSTRUCT them in the path to appropriate behavior. You also must consider that if a behavior issue is the reason this dog was displaced, it is you who must try and fix the problem. Your job is not to allow these poor dogs to remain victims but to rehabilitate, teach and insure that this will be their “forever home”. If you follow your brain and not your heart…you have an excellent start. Do what makes sense for the dog….not what feels good for you. For example, lets not start out with letting the new dog sleep on the bed because you “feel sorry” for him and send him the wrong message as to his status in your home. The bed is a place of earned empowerment. 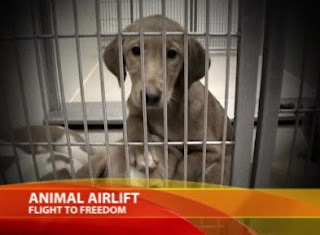 Definitely a no-no…these poor dogs should never be treated like victims if they are to normalize and assimilate back into normal life. There are overall rules for adopting a dog that are essential to the success of the entire experience. The worst thing any new parent can say is “ Well I thought……..”. Thinking means you are not sure and a simple phone call to the shelter or rescue can turn that “think” into a “know”. Ask all questions no matter what. These dogs are not science experiments where you simply see what happens. Always remember that they (the dogs) suffer the ramifications of any mistakes. When we take charge of a living being it is our job to know everything necessary to accommodate our new addition. Lets start with basic concepts of learning and behavior. Here is your mantra: “Your reaction to anything a dog does, dictates the frequency of this behavior”. When a dog enters your environment, he is like an alien. He does not speak the language, know where the bathroom is, who is in charge, and worse than anything, he is in a state of trauma due to the loss of his old pack. You are his guide back to security and safety. You will do this by STRUCTURING, INSTRUCTING AND MONITORING. A CRATE: When a new dog enters your environment, he first seeks the new “pack” rules. Kind of like opening a new iPOD and looking for the instructions on how to make it work. The crate provides a place of safety, security and most of all allows for the dog not to have to make inappropriate choices. Think of the dog like a one year old child you are babysitting. 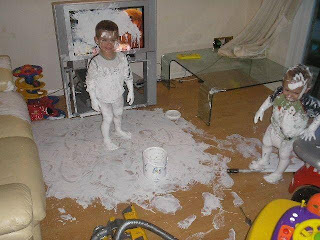 Since you do not know what this child will do when left alone, you would always make sure the child is in a playpen, a crib, or high chair…….to prevent mistakes. That’s what your crate is for. A prevented behavior will not develop, but a learned behavior is tough to cure. If a dog never gets a chance to chew on the leg of your coffee table, through habituation of alternate behaviors (appropriate chew toys, proper and sufficient exercise), the dog will probably never even try. Chewing the coffee table is an unknown, therefore not an option. So your crate is a safety net against the dog learning anything inappropriate while you are busy. Do not be fooled by the “housebroken” label. When a dog moves from one environment to another, there should always be an initial re-housebreaking. 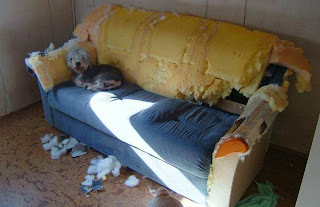 Simply apply the basic rules of housebreaking (watch dog or put in crate, wild praise for going outside, monitoring to prevent indoor mistakes) and you will lay out a plan for the dog to follow showing both the benefits, but you will avoid other possible inappropriate behaviors such as destructive chewing. The dog should initially be fed in the crate to create a “denning” instinct and to make sure he realizes that it is a good place where only good things happen. It is NEVER a punishment tool. If there are other dogs in the home, the new dog MUST always be fed in the crate until he establishes himself with his new pack. Otherwise he will be considered an intruder. If it is a foster dog, he/she is NEVER fed with the other dogs in the household. If the dog is an adoption, his place in the pack will be established over time and group feeding can be initiated. But for heaven’s sake, don’t stress dogs out that have to share their home with a surprise dinner guest. THE LEASH: All fosters/adoptees should drag a short leash around the house ( this is when the dog is being monitored, not in the crate…..NEVER leave a leash on a crated dog). Having that leash hang from the dog will become your main communication and corrective tool for behavioral mistakes. If you see the dog heading for an inappropriate behavior, the leash will allow you get the dog quickly, if you need to, without being too invasive (particularly important with small dogs who might be skittish). You are much better off and safer grabbing a loose leash than trying to grab a new dog by the collar. That dog has no idea what your intentions are when you reach for him. If he was inappropriately corrected in his former home, this could trigger an unnecessary fear response. Grabbing the leash is more instructive than punitive. 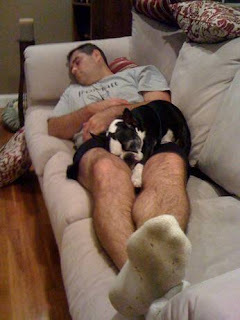 Say for example, the dog jumps up on the couch. Instead of screaming or grabbing a dog (especially one you don’t know) by the collar, you simply pick up the leash and say “off”, then praise and treat the dog. This is instructive and gives the dog CHOICE. You are maintaining your authority without intimidation as YOU DON”T KNOW WHAT BUTTONS YOU MAY PRESS otherwise. The leash is your signal to the dog that your are in charge of this environment and is your tool to instruct and enforce the new pack rules. TREATS: Food is the universal language. It goes back in our history as a sign of peace and commonality. Breaking bread with someone means making friends. To a dog it is the clearest marker of a dog making the correct choice. This is not to be confused with the dog making the choice BECAUSE of the food, but when the food is provided as a reward for behavior this increases the predictability that the dog will realize this is a behavior that should be repeated. You cannot use enough food rewards with foster/adopted dogs. If you couple the rewards with compulsion, the dog will be clear that when you speak, it means something and when they comply……something good happens! Its all about choice and balance. As wonderful and giving as it is to foster or adopt, it should never be at the expense of the animals already in the home. They are priority. You never compromise the integrity of your existing pack or you weaken your standing in their eyes. Whenever I foster a dog, they are kept crated in my office in a separate part of the house. They are never allowed in my living quarters as this is my dogs home and this foster would immediately be perceived as an intruder and disrupt pack order. Your first introduction can either make or break your success in allowing your own animals to accept this new “guest” or family member. Dogs should be introduced on-lead in a neutral zone. Walk them without letting them have contact for a few minutes. Then when body language appears comfortable allow them to get closer and closer, till they can properly introduce themselves. This will lessen the feeling of intrusion for all concerned. That process should be repeated with each member of the existing household separately to avoid pack panic. In other words if you have three dogs and take in a foster, don’t let them all meet at once as pack dynamics can overtake the situation. Once an initial intro has been made, the foster should be kept separate and allowed contact only in certain specified areas (backyards, basements etc.). If you allow the foster dog total access, you completely change the dynamics of your own pack and this will stress the house dogs out. This is especially true if you do a lot of fostering. Your own dogs have a right to pack structure and stability. Keep the foster in “guest” status and you will lower your risk factor of problems. NEVER FEED THE NEW DOG WITH THE HOUSE DOGS unless you have this dog for at least 30 days. They should always be fed in the crate for at least the first 2 weeks. All the dogs have a right to security while they acclimate to each other. When new dogs are allowed to mix with house dogs, there should be no food based toys (rawhides, pigs ears etc). Nylabones, balls, Frisbees are fine. These toys will give you an idea of how well the new dog can “share” without tapping into the primal food instinct. Put no toys at all down if you have a house dog with possession issues. If you do have a new dog for more than 30 days and want to feed him with your house dogs, start by feeding him last in an area away from where you feed the house dogs, but within site. If there is a problem, this gives you a chance to grab the new dogs leash and control the situation. If your own dogs have food issues, NEVER FEED WITH THE NEW DOG. The process will be different for every dog and never RUSH to teach the dogs to eat together. Let it evolve. Cats or other pets are a judgement call. Always introduce with foster on leash and give the cats an escape route. If you have Parrots, with bird secured in cage, bring dog up to cage on leash. In either case, if there is no reaction by the foster dog…immediate praise and treat. My opinions on the subject of children are very popular with breeders, shelters, rescues and others who know the following bite statistics. According to the CDC in Atlanta, 70% of all dog bites in this country are to children. 50% of that number is to the childs face. Almost half of all dogs surrendered to shelters or rescue organizations, involve inappropriate behavior around children. I had a woman call me recently about a Border Collie puppy she had just purchased from a breeder in our area, A breeder we know sells extremely unstable dogs. I had 3 of this breeders dogs in my school in the last year and all had aggression issues. It was pretty much a situation of anyone with cash could get a puppy. Now, I have worked with Border Collie Rescue for years and they are NOT dogs for families with young children due their intense herding and protective instincts. They are working dogs, not pets. My own Border Collie was a rescue and he runs 30 classes a week with me after being bounced out of 4 homes. He even works with Deaf Children as a Therapy Dog. For me, he is perfection. But not for everyone. And he clearly is an exception to every rule of being a Border Collie. Plus I provide him with the ideal Border Collie home. Anyway back to our lady with the Border Collie pup from the shady breeder. 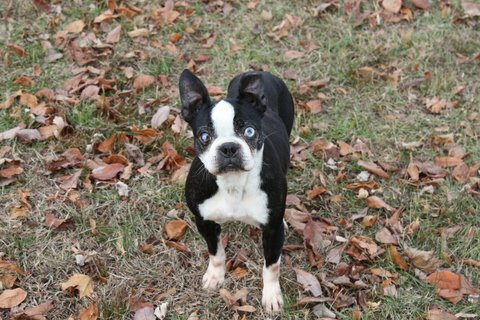 She bragged to me on the phone that she has 3 small children and almost every breeder in the state had turned her down (duh….they were trying to tell you something)….till she found this one guy. Everyone had told her that these dogs were not right for her home environment, but she knew more than everyone and KNEW she could have a Border Collie in a home with 3 toddlers. I never got past the puppy orientation with her. In training and explaining dogs for twenty years…..here was a woman who was convinced she knew more than me, the good breeders and most of the continental U.S. Never promise to do anything with a dog you have NOT done before. She went down in flames. The dog nipped all three kids in the first three months and the poor thing ended up in rescue. Note* I did not take her as a client past the orientation. If someone is following their own agenda I will not allow my name to go with it. Particularly when a child’s safety is at stake. Since she appeared to know more than anyone, I saw no reason to take her money. This is just one of many examples SO, I will say this and I stand by it. Children under 6 and dogs are NOT a good mix. A childs’ lack of structure around a dog, mixed with the intricacies of a dogs culture and pack structure, spell potential disaster for both child and dog. Now this is not to say that children cannot be TAUGHT to be safe and co-exist properly with a new dog. I do seminars on Dog Safety in schools regularly. When a dog enters the house, the rules for children MUST adjust so that everyone is teaching the dog the same things. Like the parents not wanting the dog to jump on guests and yet the kids favorite game is chase me, chase me, then tackle me. Not very clear for the dog. The problem appears to lie at the feet of the parents in this case. There is a bizarre notion in this country that a sign of a dogs temperament is measured by the amount of torture he will endure by the children in the family. I have had people actually brag about how “good” their dog is, because the kids climb all over him, pull his ears and hang on to his tail. Last week, while doing our Read to Dogs Therapy program, I had a toddler do a flying leap on my Doberman who was laying down listening to a child read to her. The toddler’s mother came running up and apologized and chastised the child by saying, “you can’t do that to this dog…only our dog at home”. This child is a bite waiting to happen. If he had not jumped on a well trained Therapy dog…he would surely have been bit. Parents….read this next sentence carefully….DOGS ARE NOT TOYS FOR YOUR KIDS. I cannot tell you how many parents have sat in front of me with toddlers and a dog. I have explained that the dog is not the only one that needs structure for at least the first 6 months. The next part of the conversation invariably involves the parents lamenting on “how many times” they have told the children to behave around the dog. This usually cracks me up. I always follow up by asking them if their children play with matches, run in the street, play with their camcorders, or light the stove??. The answer is always “NEVER”. Then the parental light bulb goes on and the parents realized their ability to stop certain behaviors by their kids is completely in their hands. People often ask which dogs are best with kids and my answer will always be the same. The dogs that are best with kids are the dogs in a house with kids who are best with dogs. Kids who are structured, listen well and old enough to communicate with a dog, are ideal to make this situation work. The bottom line to adoption is to think with your head and not your heart. Done right, adopting an animal in need can be spiritual in its benefits. So once you’ve made the decision to adopt take the time to make sure it will be a success and that you are the one’s to provide this new addition with a forever home. I just wanted to give everyone an update on our Ha-Na. She was adopted! I just spoke with her new family and she is doing wonderfully! She is going up and down their steps like a pro and prancing her way down the busy streets of Brooklyn! Hard to believe a 9 year old puppy mill girl with one good eye has found such a wonderful home and a great new life! She is sleeping in a dog bed and making herself at home with her new family. Ha-Na has come so far from the day we brought her into foster, Ha-Na was so scared and dirty I didnt think she would ever find a home! But she has! She is a great example of how there are people out there who want to adopt these dogs, even when they are 9 years old, half blind and still pee of the floor! Thank you everyone who supported me and Ha-Na while she was with us. We are so overjoyed that she has finally found her forever home! 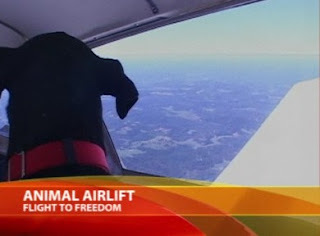 Great video from Yahoo News about pilots rescuing shelter animals and flying them to new welcoming homes. Just a quick note to let you know that Battley is doing great. He’s made himself very comfortable and has been so agreeable with Bella that I’m beginning to wonder if he was snippy at first because he wasn’t feeling well. Taking toys out of the equation until we all got to know one another might’ve done the trick, too. There has been a stuffie on the floor for two days and no fighting over it. He will be fine with other dogs (amicable, but not playful) as long as his new brother/sister is calm and submissive and his owners go very slow. Definitely no young kids though, he’s not very careful with the few teeth that he has. I barely notice that he’s deaf, he loves to follow me around everywhere so a little wave of the hand and he’s right by your side. Stomping my foot on the floor gets his attention - if he feels like it. He knows to sit for treats and lifts his paw to shake hands. If he’s out of eyeshot, it’s safe to assume he’s asleep in his bed, he doesn’t have any interest in making trouble. We have had ONE, just one, small accident in the house – and that was when he was sick. He is very well house broken and loves to be in the yard, but he comes right in when he sees you at the door. He must’ve been taught to ‘sit pretty’ or dance for treats somewhere along the line, but his old man legs don’t support him anymore and he falls over backwards when he tries to do his little dance, so we have to be careful when he gets his treats. His first bromide level check came back in the therapeutic range – the vet would like to see it a little higher, but since he’s reacting so well to his medicine he doesn’t want to up the dose quite yet. We haven’t had another seizure or even vomiting since he began the sodium bromide. He will really thrive in the right situation and would be tickled pink if someone was home with him most of the day. He’s 100% a people dog. He's doing great with his new family!